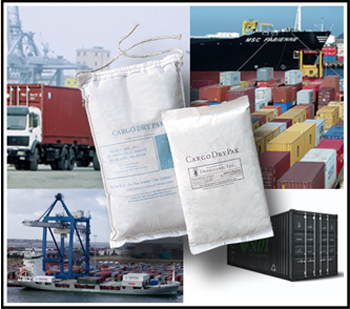 Desiccants for shipping containers, cargo and moisture barrier packaging. Specially formulated desiccant product designed to eliminate condensation inside shipping and storage containers. By eliminating condensation, these desiccants easily protect cargo from mold, mildew, rust and corrosion while goods are in transit. They have sewn cloth bags with tie strings for customers who prefer to hang Cargo desiccants from the hooks inside containers. Desiccants for shipping containers and moisture barrier packaging. Cargo Dry large desiccants packs that fits in the corners of shipping containers to help control humidity. 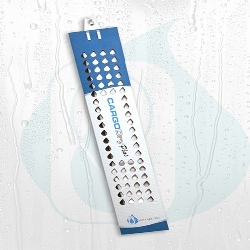 Cargo Dry is a specially formulated desiccant designed to lower the dew point. It consists of a three bag strip containing 1000 grams secured to a convenient hook that is easy to hang in any container.